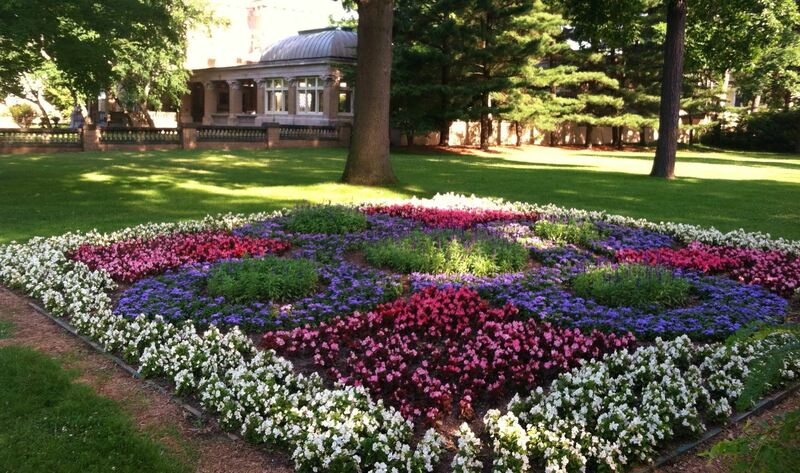 Ruthmere is a proud charter member of the Elkhart County annual Quilt Gardens along the Heritage Trail. 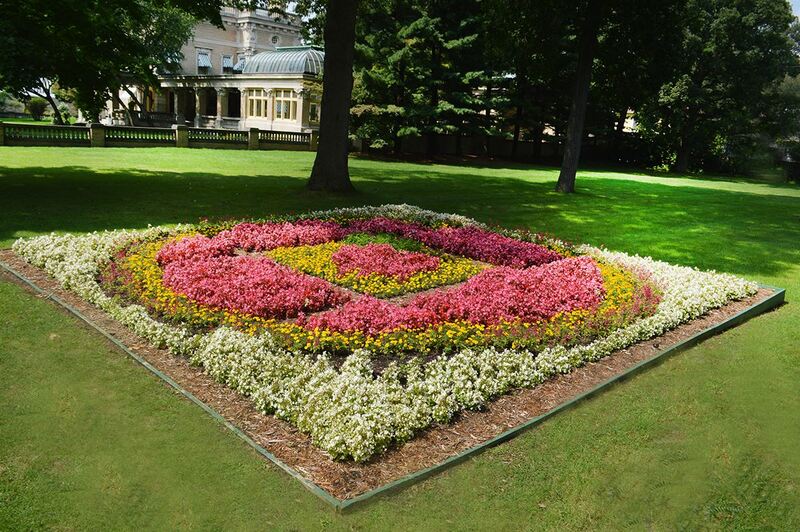 Located on the east lawn and visible from Beardsley Avenue, Ruthmere's quilt garden reflects design inspired by local history. The Quilt Gardens along the Heritage Trail is a FREE flexible, self-guided adventure you can enjoy at your own pace annually May 30 through October 1. 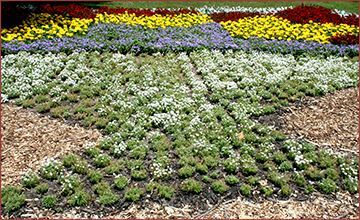 The Quilt Gardens are an ever-changing patchwork that are perfect for return visits! Maps are available at each site. For more information on the Quilt Gardens along the Heritage Trail go to www.QuiltGardens.com. 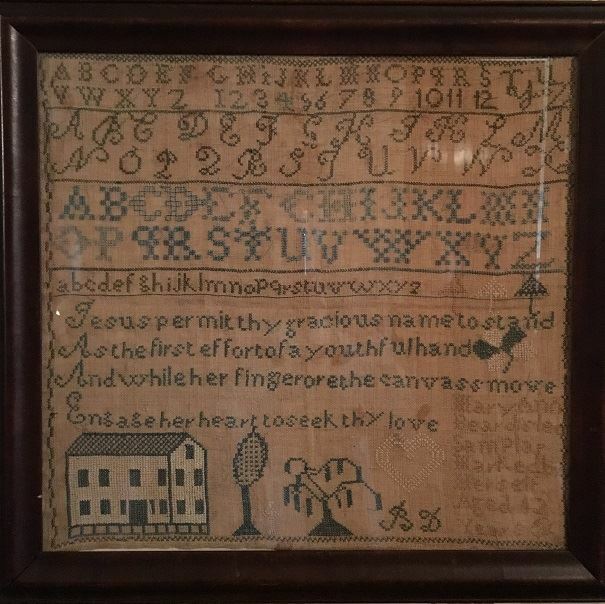 The “Bow Tie” quilt-block pattern dates back to the late 1800s and reflects the history of the residence and the black-tie events that were hosted by the Beardsleys as well as current events offered by the Museum, such as One Night at Ruthmere held in September. 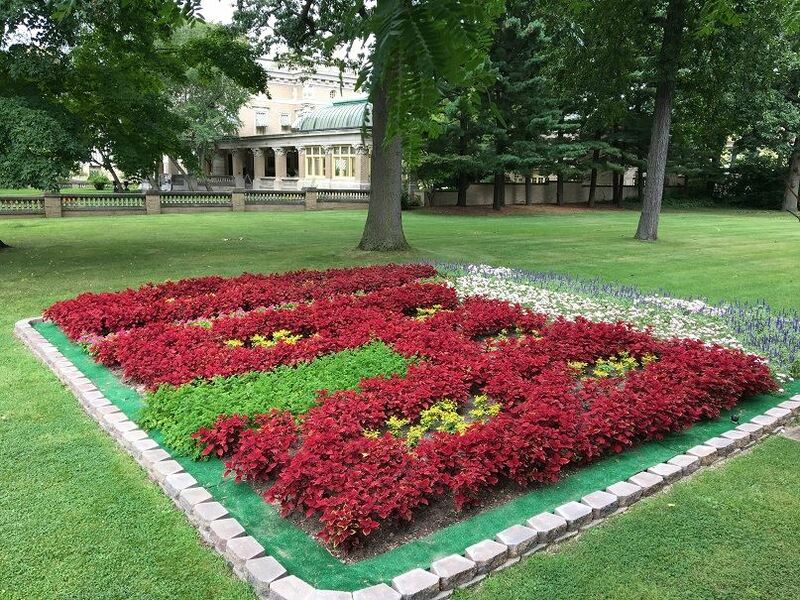 In keeping with those memorable parties, the Quilt Garden is all decked out with a black bow tie of Black Dragon Coleus resting on a field of Olympia Super White Begonias. The garden projects simple elegance and by using just two plant types. You’ll find high contrast and clean lines dominate. 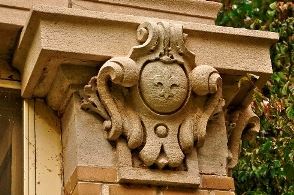 In addition, the histories of these plants are in keeping with the time of Ruthmere’s construction. 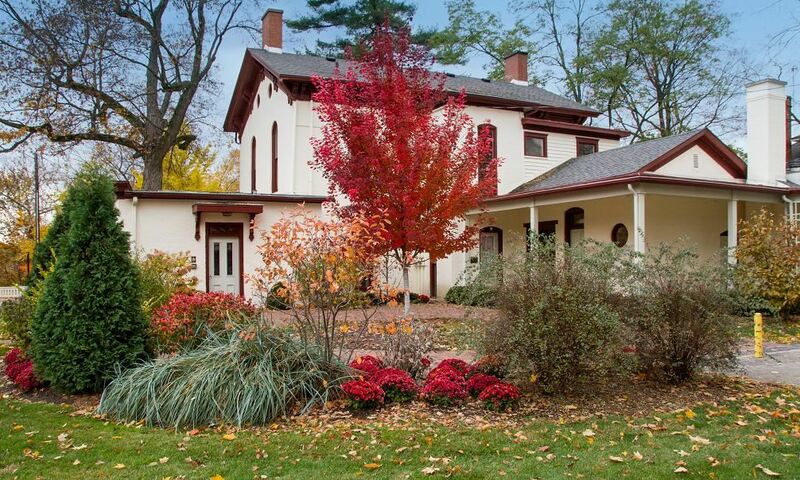 Honoring Elkhart's founding family Dr. Havilah and Rachel Beardsley, the Elkhart Founder Homestead is a modification of the popular "school house block" design, fashioned and altered slightly to resemble the Havilah Beardsley House located at 102 W. Beardsley Ave., Elkhart. The garden design was inspired by a hand-embroidered sampler made by Mary Ann Beardsley at the age of 12 that hangs in the family sitting room at Havilah Beardsley house. It depicts the house in the late nineteenth century. The Crossed Canoes pattern dates back to 1895. There are so many ways to tell a story and in this case the telling is in a pattern of two colorful canoes - one yellow and the other brilliant red. Each is intensely planted with annuals that might have been found in the many gardens of the original owners, Albert and Elizabeth Beardsley. The Crossed Canoes represents the important role that water plays on the Ruthmere Campus with the confluence of the Elkhart River, the St. Joseph River and Christiana Creek. Christiana Creek in particular has become a regional focus as a recreational blueway, and Ruthmere's Creek House Center pictured at left serves as an ideal home base for canoe and kayak clubs looking to tame its waters. Ruthmere's "Pomegranate Window" Quilt Garden Along the Heritage Trail is planted thanks to the many volunteers who dedicated their time on a hot sultry day. 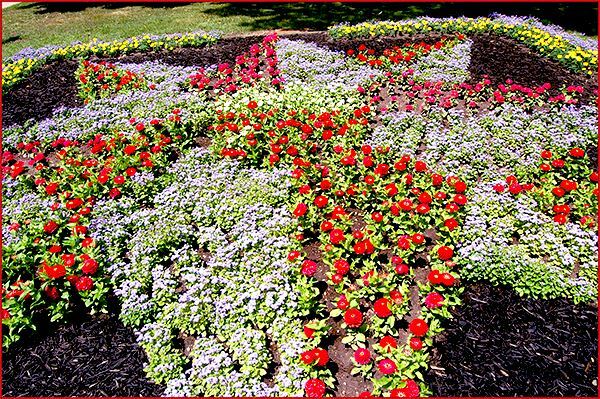 "Quilt Gardens on the Heritage Trail" is sponsored by the Elkhart County Convention and Visitors Bureau. 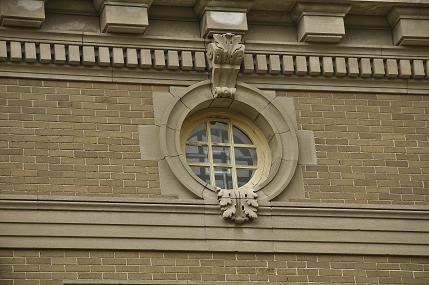 As in previous years we looked for inspiration within the walls of our historic home. Ruthmere has 292 pomegranate (we recently found 3 more than previously thought) decorations inside and out adorning the mansion. 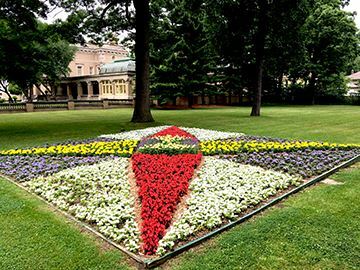 The quilt garden reflects this design motif unique to Ruthmere. Notice in the picture above the restoration work happening in the background at Ruthmere's greenhouse. The new Adopt a Pom campaign is geared toward building a fund to support Ruthmere's ongoing preservation needs. 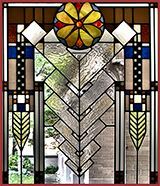 At night we will illuminate one of the south facade occular windows facing Beardsley Avenue with a brillant garnet red light--look for the Pomegranate Window this summer. As in previous years we looked for inspiration within the walls of our historic home. 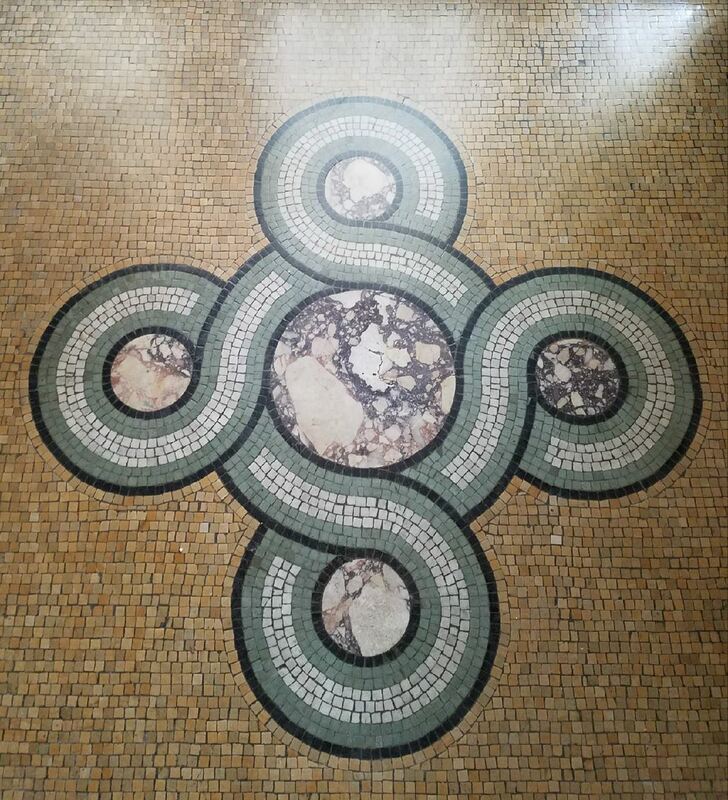 The entrance to the front foyer of Ruthmere offers a recognizable archetype that is rich with symbolism, the “infinity" pattern. This pattern, with its continuous flowing paths, can be emblematic of the infinite passage of time or the constant bond built by a lifetime of friendship. Albert and Elizabeth may have chosen this pattern to offer a warm welcome to those who entered their home. 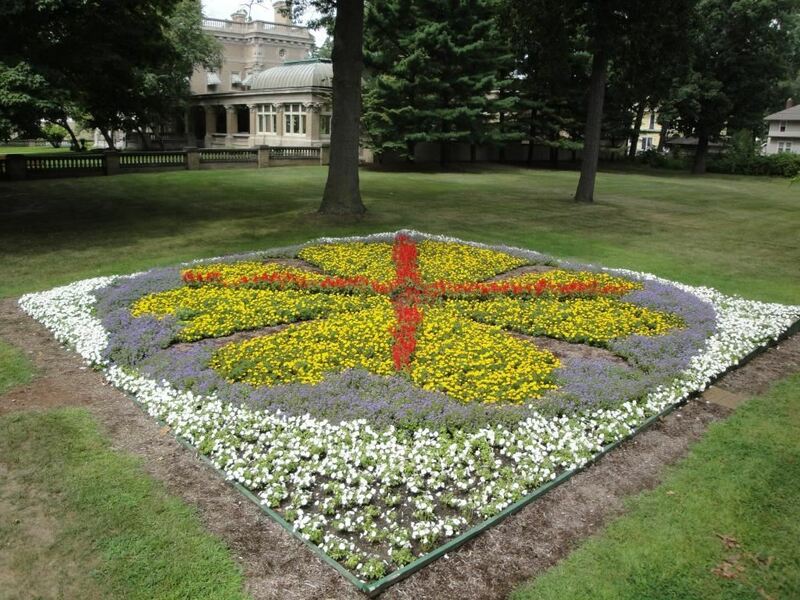 For 2013, our quilt garden design comes from the iconic French fleur-de-lis often seen as a decorative motif on Ruthmere's Beaux Arts exterior. Literally translated, fleur-de-lis means "flower of the lily" and is thought to actually be a species of iris. It has been used by many European countries on flags and coats of arms, but it is most widely associated with the French. According to French historian Georges Duby, the three leaves represent the medieval social classes: those who worked, those who fought and those who prayed. 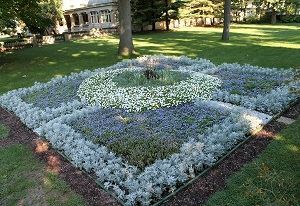 For 2012, our quilt garden is inspired by Ruthmere's blue and white wedding garden located inside the wall on the mansion grounds. Every year many couples choose to have their wedding in this historic garden. 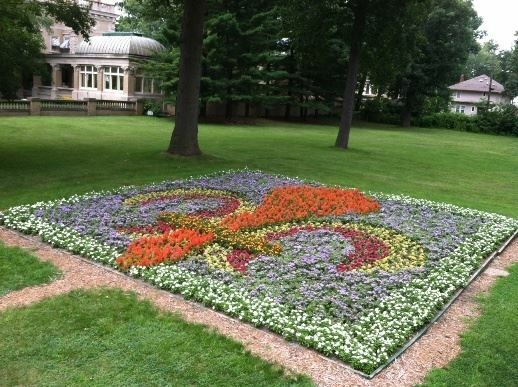 In 2011, Ruthmere's quilt garden design was called "Prairie Rose," a design taken from the iconic prairie stylestained glass windows located inside Ruthmere's main entrance. This is a traditional American pattern that reflects Ruthmere's spring show of tulips through out the Ruthmere grounds. The Flower Basket design was chosen as it is a pattern of a quilt in our Ruthmere collection. We choose plants that have bright colors and bloom profusely. The Mariner's Compass design, with its distinctive many-pointed medallion is modeled after a quilt owned by the Beardsley Family. 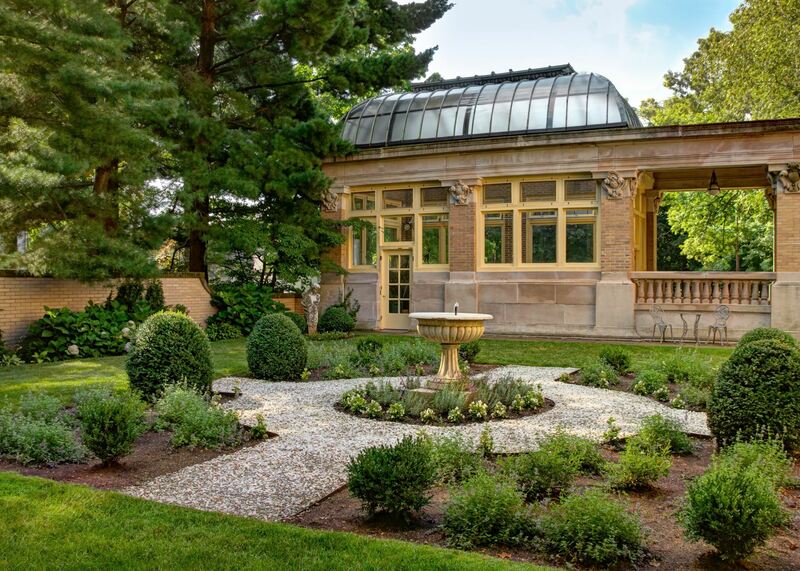 On the north side of the Havilah Beardsley House is the Kistner-Firstenberger Plaza Garden. Great care was taken by Leedy Architects in designing this landscape through the selection and placement of heirloom varieties of flowering plants and shrubs to build an appropriate "thicket garden" to shield the space from Main Street's traffic. Tiled with recycled street paver bricks from Elkhart city streets, this plaza garden is a place to enjoy the peace of nature, while contemplating the geographic significance of the confluence of the St. Joseph and Elkhart Rivers. 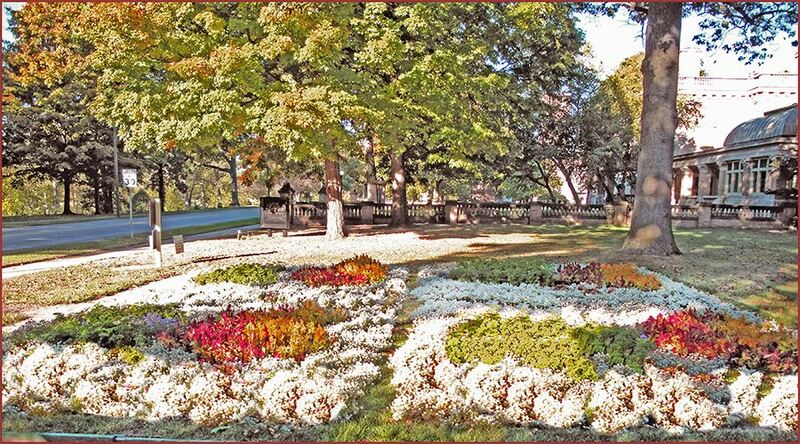 The Kistner-Firstenberger Plaza Garden received the 2011 Fairbanks Award for Community Beautification from the Greater Elkhart Chamber of Commerce. The Kistner-Firstenberger Plaza Garden is also the site of the Marilou Ritchie Memorial Garden. Marilou Ritchie served as the archivist librarian at Ruthmere from 1985 until her death in 2011.